Preheat the grill. 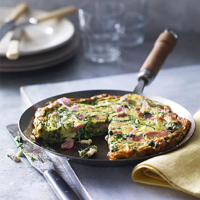 Beat the eggs in a mixing bowl and stir in the cooked spinach and bacon mixture, the brie, milk and seasoning. Heat the remaining oil in an ovenproof non-stick frying pan, add the mixture and stir to bring the cooked egg to the centre allowing the runny egg mix to cook. Leave to cook for 3-4 minutes until the base is browned and starting to set. Place the pan under the grill for 2-3 minutes to brown the top. Serve warm, cut into wedges. You can replace the spinach with shredded curly kale or spring greens.